NIBIRU,PLANET X Admitted by Scientists – NASA shuts down Space Telescope ‘WISE’!! Astronomers spot ‘planet’ in Oort Cloud, but are they mistaking Tyche for her sister? The hunt is on for a gas giant up to four times the mass of Jupiter thought to be lurking in the outer Oort Cloud, the most remote region of the solar system. 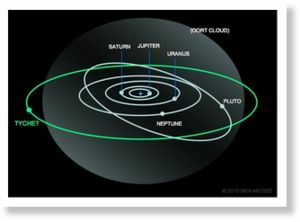 The orbit of Tyche, as it is provisionally called, would be 15,000 times farther from the Sun than the Earth’s, and 375 times farther than Pluto’s, which is why it hasn’t been seen so far. But now scientists believe the proof of its existence has already been gathered by a NASA space telescope, Wise, and is just waiting to be analyzed.